I've shared this before, but I love to keep a basket of finished cards and tags on a shelf in my craft room so that I can sift through and grab one at a moment’s notice. I keep cards and tags of all kinds—birthday, wedding, holiday, etc—but the type I grab for the most are generic ones that I can give to a friend to let her know that I’m thinking about her, or that I just want to tell her “hello”. 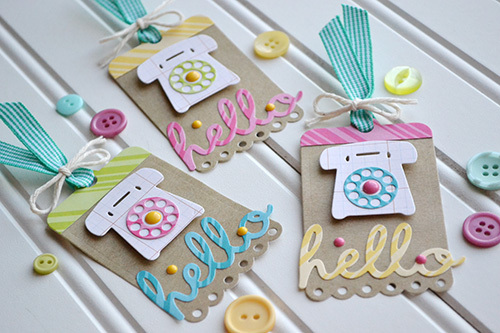 Since I never seem to have enough of those on hand, I decided to make a set of “hello” tags that I can attach to little gifts or flowers when I want to brighten a friend’s day. I was so excited to use the Phone Home Die—I fell in love with it the moment I saw it. 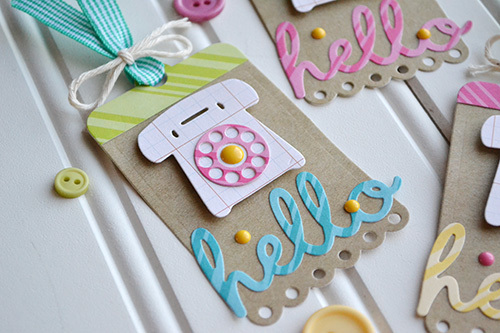 I love the little rotary phone and “hello” sentiment in the script font. Super cute! For these tags I used a few of the new Dots & Stripes8x8 Paper Pads. I cut my tags from the Neutrals pad using the Designer Tag Set. I love the look of the kraft paper! Then I used the white grid paper from the Neutrals pad to cut my phone shapes, which adds some nice contrast to the kraft. To add some color to my tags I die cut the remaining elements from the Spring and Brights 8x8 pads in some happy spring colors. I love the variety of colors available in the Dots & Stripes collection. It was easy to find exactly what I needed for this project. 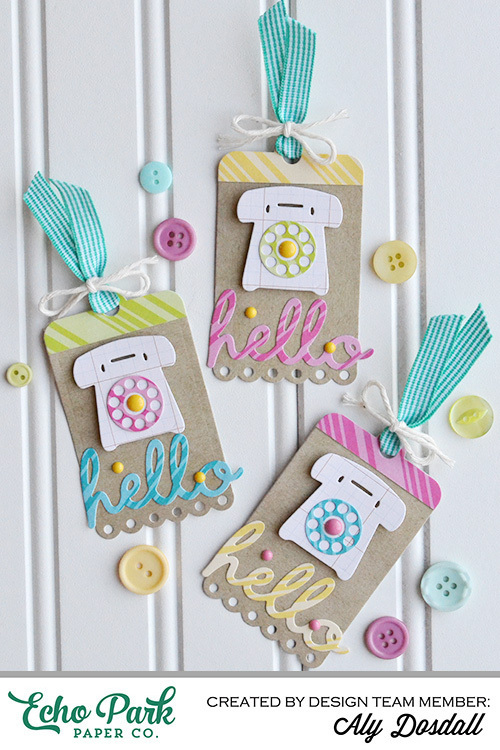 These little tags would make a great gift as a set, or can be added individually to gifts or treats for friends. For additional photos and tips, visit the original post on the Echo Park Paper blog HERE.